WELCOME TO MY MONEY MISSION ONLINE: WHO DAT? IT'S THE SUPER BOWL CHAMP SAINTS! WHO DAT? IT'S THE SUPER BOWL CHAMP SAINTS! Or, the LITTLE QB THAT COULD!! Saints VS Colts......And, the SAINTS are THE Super Bowl XLIV champions!! WA-HOO! I just LOVE rooting for the underdog, and root, root, root I did!! I should have stayed AWAKE, because my "boys" turned the tables on the Colts and WON! Hubby was nice enough to show me the video replays of the game, and it totally reminds me of that children's story The Little Engine That Could. According to Wikipedia, the story of the little engine has been told and retold many times. The underlying theme however is the same - a stranded train is unable to find an engine willing to take it on over difficult terrain to its destination. 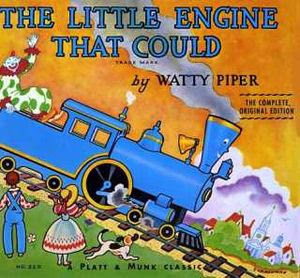 Only the little blue engine is willing to try, and while repeating the mantra "I think I can, I think I can" overcomes a seemingly impossible task. After that task was completed, it congratulated itself by saying, "I thought I could, I thought I could." "QB nobody wanted becomes player who outdueled Manning in Super Bowl..." That headliner grabbed my attention and I read the article on msnbc. The author of the article wrote, "The Saints have several players whose original teams let them go. The Saints took them in and gave them a chance to succeed. And most of them went through the Katrina aftermath, sharing the pain and the loss and the struggle to come back." He is my kind of guy! Don't forget.....Tomorrow is the day for the Denny's FREE Grand Slam. As stated on their website: "We're doing it again. Come to Denny's for a Free Original Grand Slam®, Tuesday, February 9, from 6 a.m. to 2 p.m.
And don't forget to visit Denny's for a Free Original Grand Slam® on your birthday. Last year we drove past 2 Denny's on La Grange, I'm thinking Tinley Park and Orland Park. Both of them had lines out to the parking lots, several people deep. I'm all for free, but I can't stand for long so I don't care how free it is, I'm not waiting. Lol! My daughter was off school that day for her monthly appointment. We ended up going to Mcy D's. She was happy. We are in mourning here in PA over the Colts....well, hubby is.